Here is a great opportunity to get in to a local favorite pizza location cheap! Reviews are fantastic and locals love their East Coast style pizza recipes. This pizza restaurant for sale is in a great location and at such a low price, how can you beat it! Seller just want’s out. Bring a reasonable offer and this place will be yours! Currently restaurant is only open 4-7:30 Monday – Saturday. Are you ready to put in a little work and pull in the sales that are there for the taking? Simply opening the doors for regular business hours and being open for business is marketing 101, do it and watch sales jump. Previous owner in 2012 and 2013 was doing 25-30k per month in sales. 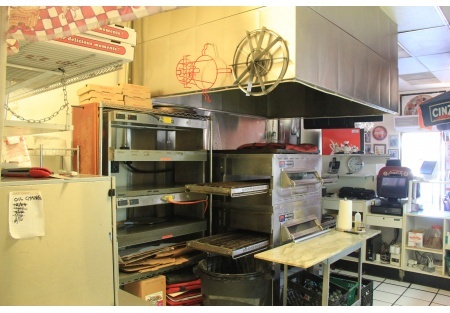 This is your chance to get in to a turnkey pizza location with big potential for very little money. Sales with minimal hours are in the 7-10k per month range. Base rent for this approximately 850 square foot space is only $1500/month. Total rent, which includes NNN, trash and water, is only $1710/month. End cap corner location facing a busy road with great roadside visibility this is a location that could easily succeed with a dedicated owner/operator willing to put in the effort. Don’ miss this opportunity to polish up this diamond in the rough that the seller is willing to make you a great deal on. Now is the time to write up the offer, how much do you want to pay?